One unfortunate side effect of the Bay Area’s prosperous economy and resulting population growth is heavy freeway traffic, which some longtime residents feel is worse than it has ever been. Luckily, our region offers access to many excellent public-transit systems, which can not only relieve stress and help the environment but also save money lost while stuck in gridlock — an average of nearly $1,500 per year in larger American cities. In a recent analysis, SmartAsset ranked the best U.S. cities for public transportation based on the average commute time for users, as well as how long commutes take compared with driving. Additionally, the study factored in the percent and number of a city’s public-transportation users and the difference between the citywide income and the income of transit-systems users. A lower income gap indicates that the systems are viable enough to attract a broad swath of the population. San Francisco ranks No. 2 in the U.S., behind Washington, D.C., for best public-transit systems, with an overall index score of 98.12 out of a possible 100. Whether they frequent BART, Muni, or Caltrain, San Franciscans using public transportation make it to work in an average of 40.3 minutes, 10 minutes longer than drivers. Thirty-four percent of residents have adopted public transportation, and users make just 4 percent less than the citywide median income. As Bay Area residents priced out of San Francisco increasingly migrate to Oakland, public-transportation adoption has increased, making the city the nation’s 10th best for mass transit with a score of 90.59. Twenty-one percent of Oakland residents use public transit, and the customer income gap is even smaller than that of its neighbor: 2 percent. The average commute via public transit in Oakland takes 44.3 minutes, 17 minutes longer than driving. Besides BART, Oakland commuters have plenty of other public-transit options: AC Transit buses, ferries, and casual-carpool stops throughout the city. Nationwide, public transportation is growing in popularity, with adoption up 9 percent over the last five years. Although San Jose didn’t crack SmartAsset’s list of top cities for mass transit, the company notes that the region has seen mass-transit adoption grow by more than 20 percent since 2011. 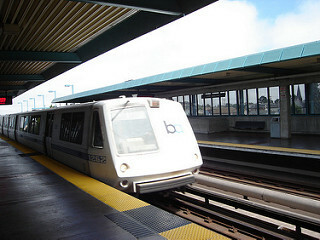 Caltrain offers service throughout Silicon Valley, and the Santa Clara Valley Transportation Authority operates an extensive network of bus and light-rail routes. Later this year, North Bay residents tired of the Highway 101 grind will have an alternative, as SMART trains begin service in Marin and Sonoma counties. The first phase of the project will offer service between Santa Rosa and San Rafael. During the second phase, service will be extended as far north as Cloverdale and south to the Larkspur Ferry Terminal, where commuters can take a ferry to downtown San Francisco. In Pacific Union’s Real Estate Economic Forecast to 2018, prepared in partnership with John Burns Real Estate Consulting, analysts at the company said that the SMART train could help drive demand for real estate in Marin and Sonoma counties, particularly from those who work in San Francisco.